First Round...seriously...you will have seconds! I don't live in a part of the country where taco trucks are a big thing, but if I did...boy would I make them a big thing in my life. We do have one family owned Mexican restaurant that started as a truck in the parking lot of a Latin-American market. After first time I ate these creations, I never tasted a regular taco the same. From the warm corn tortillas, meat spiced so perfectly, the fresh cilantro and ooh...the salsa! I rarely make tacos in flour tortillas anymore. With my slow cooker at hand, I am exploring the options for making shredded meat for tacos. 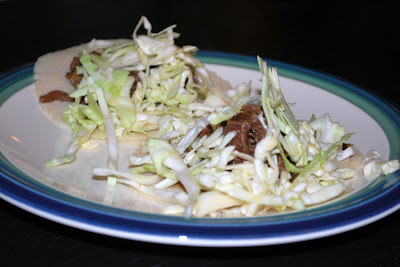 I found this recipe for Korean Beef Tacos in the slow cooker and it was an immediate hit. Instead of the traditional taco spices like cumin and chili powder, this uses the sweet, spicy combination found is Asian cuisine. Topped with simple, toss together, coleslaw, this recipe if perfect for those nights you walk in the door at 6 starving. Couldn't be simpler! Dump all this in the Slow Cooker. My roast was frozen solid today. Cook on low for 8-10 hours, flipping a couple of times if possible. The meat is done when it can be fully shredded. Serve on Corn Tortillas (or flour if you prefer). Top with Simple Slaw. Toss all of the ingredients together, this does not keep well so throw it together right before you eat and don't make extra. I love that this recipe gives me another option for a roast. I love to use this affordable cut, but I am always at a loss. I know how to make great pot roast...but I know we wouldn't want to eat it every week. Jude thought his plate looked better! I actually cooked this yesterday, it reheated perfectly! I'm trying to come up with a vegetable of sorts to go with this, I'm thinking corn/black bean something. This recipe could easily cooked ahead and reheated. Only down side I see in this recipe is it is so good, there will be NONE left! Hope you love it as much as I do. I am going to try these this week. How do you think honey would work in this dish as a sweetener? I think it would work great. Let me know what you think. Yum! I think I will try this. Thanks for the post.